Benchmark looks at 12 products and systems of interest for security installers and system integrators involved in the design and installation of video management software-based solutions. Cayuga is the VMS series from SeeTec. It is differentiated from many other VMS solutions by its ability to have the core functionality supplemented by sector-specific extensions, allowing it to deliver security and closely targeted business intelligence. Available extensions include logistics-ready integrations, ANPR, warehouse management, retail, etc..
As a standard VMS package, Cayuga is available in four options. Cayuga S50X supports up to 50 cameras on a single server. Stepping up from the base level is Cayuga S100, supporting up to 100 channels on two servers along with basic video analytics, motion detection and advanced event management. Cayuga Infinity supports unlimited devices and unlimited servers, along with a range of video analytics options, and Cayuga Infinity X builds on this with failover recording and video wall management. Cayuga takes an open platform approach, supporting in excess of 1,000 devices via direct integrations. Additional devices are supported by way of ONVIF compliance, and smart drivers are utilised to simplify the potential integrations with third party applications. Cayuga has been designed with installers and integrators in mind. Installation is simple, as is configuration. Cathexis Technologies offers CathexisVision. System capacity is dependent upon the licence, but the VMS is capable of supporting unlimited servers and cameras. Video formats include H.265, H.264, M-JPEG and MPEG-4, and multiple streaming is supported. The software can also manage inputs and outputs and audio streaming. CathexisVision supports direct integrations with a number of third-party cameras and encoders, as well as ONVIF compatible devices. There are four licensing options: Lite, Core, Professional and Premium. Both Lite and Core support up to 48 devices running on a single server. They also support 3 and 7 client connections respectively. Professional licensed systems support up to 150 devices with an unlimited number of servers and 10 client connections, and Premium licences allow unlimited devices, servers and client connections. All variance of the VMS allow the use of edge analytics, fisheye-based camera dewarping, local VMD, motion search and camera mapping. They also make use of set-up wizards to simplify configuration process. Much of the GUI interface is tab-based, making it simple to switch between various system elements. The VMS does have some interesting features: camera mapping allows the display of adjacent devices when viewing video streams, and the logical order of the configuration ensures that everything is covered. exacqVision is an open platform VMS which delivers third-party compatibility for more than 3,300 devices. The VMS is available in four variants: Start, Professional, Enterprise and Edge. Start supports 16 devices and 1 client connection per server, Professional and Enterprise can manage 128 devices and 16 web client or 512 thin client connections per server. The Edge version runs the VMS on a camera and archiving is to an SD card. 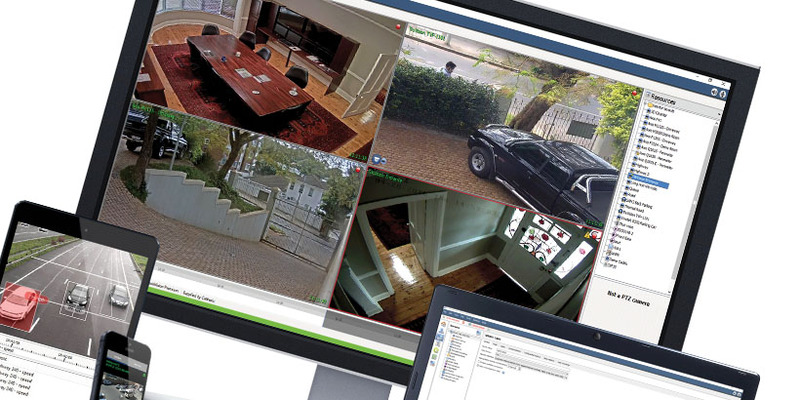 Designed to be easy to install and configure, the VMS makes use of automatic detection and connection to cameras. The EasyConnect function automatically finds, assigns and addresses supported IP cameras. The VMS allows integration with video analytics and business intelligence systems, as well as retail-based POS systems. It supports bookmarking and flexible search functions, and video can be exported in either open formats or tamper-protected files with an integral viewer. The exacqVision VMS offers a flexible and scalable system, and the Edge version allows the creation of truly distributed solutions where small or standalone sites need to be linked to a central control room for investigations or the collection of evidential data. ACC (Avigilon Control Center) from Avigilon is an open platform VMS which supports ONVIF compliant devices. However, increasingly ACC also allows installers and integrators to leverage some of the company’s proprietary features such as self-learning analytics, HDSM and Appearance Search, dependent upon licensing. ACC is available in three versions. Core is a single server option supporting up to 24 cameras and 2 clients, and Standard is also a single server package supporting up to 48 devices and 5 clients. Enterprise supports up to 100 servers with up to 300 cameras per server and unlimited client connections. It also supports HD Pro cameras and Appearance Search. Standard and Enterprise versions of ACC support rules-based event management (21 rules and unlimited rules respectively). Avigilon offers a high level of analytics and smart searching solutions and some of these proprietary technologies can only be accessed via the ACC platform. This makes the VMS an essential system component for anyone who invests in these technologies. Milestone’s XProtect range of VMS packages has recently been enhanced with the addition of the ‘+’ series of products. These include the free-of-charge XProtect Essential+, XProtect Express+ and XProtect Professional+. These products include advanced functionality which previously was only available in the company’s XProtect Expert and XProtect Corporate flagship products. The ‘+’ versions of the XProtect VMS series include the very flexible Rules-based engine for alarm and event handling. This is also included in the Corporate and Expert versions of the VMS. Other features include support for H.265 video formats, hardware-accelerated video decoding, centralised management and Microsoft Active Directory support. Milestone’s open platform approach incorporates direct integrations with over 6,000 third party devices from over 150 manufacturers, and as such installers and integrators are unlikely to find professional products that won’t work seamlessly with the VMS. ONVIF is also supported. The Bosch Video Management System (VMS) has been designed to manage a wide range of new and legacy technologies, ranging from the analogue Allegiant matrix systems through to the latest UHD and intelligent video analysis technologies. The main focus is the management of Bosch devices. It does support other devices via ONVIF compatibility. The VMS is scalable: additional channels, workstations and system functionality can be implemented through licensing. Alarms and events can be configured based upon device activations such as IVA, system and hardware events or can be scheduled. Event and alarm handling makes use of ‘cause and effect’ programming. Events can be created by a number of resources including edge devices, NVRs and servers, system events, user actions, authentication issues, inputs and outputs, schedules, etc.. There are some interesting options, such as creating an alarm event with notifications if images are impacted, such as if they become too noisy. The configuration menus make use of an expanding ‘tree’ type layout, and as such are simple to use. AXIS Camera Station (ACS) is aimed at small- to medium-sized sites and is optimised for use with Axis Communications’ own range of cameras. It supports other devices which use the ONVIF Profile S, but compatibility with these devices may be limited. The VMS software is optimised for systems with fewer than 50 devices. It manages resolutions of up to 4K and frame rates of up to 60fps. Video formats include H.264 and M-JPEG. The VMS makes use of the Zipstream bandwidth management system which optimises compression levels. Alarms and events can be triggered by a variety of sources: motion detection, tampering, cross-line detection, inputs and outputs, action buttons and device events. Actions can include changes in recording, notifications, PTZ switching, control of inputs and outputs, and local alerts. ACS has two licensing options: Core and Universal. Core allows the use of up to 32 Axis devices. Universal is required if more than 32 Axis devices are connected, or if any third-party devices are used. ACS is aimed at the SME market and is optimised for Axis’ own cameras. Support for third party devices is there, but is limited. Given these provisos, AXIS Camera Station works well, as it should, because it is effectively a one-brand solution. For some that will be a limitation, but if a single-brand system is what you’re after, it is simple to install and configure. Video Insight is a scalable enterprise VMS solution that captures, manages and stores video across a network, whether single or multiple locations. The VMS supports a wide range of cameras. Designed for multi-facility configurations, the software complements Panasonic’s embedded recording platforms and video management software applications. Video Insight includes unlimited licenses for selected Panasonic cameras. Third party compatibility is also available, with the VMS supporting more than 3000 camera models from 100 manufacturers and integrating with many popular access control systems. The VMS is a powerful, yet easy-to-use, and delivers an intuitive user interface, client options for Windows, Mac and mobile devices as well as a dedicated interface. VideoXpert adopts a modular approach to provide a system which meets the needs of given applications. Pelco delivers a system which is intuitive and allows the operator to access information and progress incidents without training. Support for a six monitor video wall ensures operators can navigate the system with ease. VideoXpert is a Windows-based system and is available as either a software-only product or as a server/recorder combination. The software-only product is available in three different versions. Professional supports a maximum of 256 video inputs. Enterprise supports unlimited video inputs and failover clustering. Ultimate delivers the same as Enterprise, with a unified database to allow the aggregation of numerous systems into a single control interface. Macroscop is a VMS created by the Russian company of the same name. Dependent upon the licence used, the software can support unlimited servers, and each server can manage up to 80 cameras. An unlimited number of workstations are also supported. Third-party compatibility is available for approximately 2,500 cameras; ONVIF Profile S devices can also be used. Video formats include H.264, MPEG-4 and M-JPEG. Streams can be split into two versions: high-resolution for archiving and lower resolution for display. The VMS includes integral motion detection and an ‘alert monitor’ to highlight incidents. Macroscop is available with three licence variants: a single server application with up to 20 cameras and 2 workstations; up to 5 servers and a maximum of 400 cameras plus 10 workstations; unlimited cameras, servers and workstations. The latter also includes motion detection, face detection, left object, tracking, audio detection, suspect search, auto zoom and tamper detection modules as standard. For the installer or integrator who is new to VMS, Macroscop represents a flexible and efficient product that is simple to install and configure. The software installation is fully automated and works well. The functionality on offer from Macroscop is surveillance-focused and is ideal for mainstream applications. Wave from Hanwha Techwin is an open platform video management aimed at mainstream surveillance-based security solutions. The company has highlighted Wave’s ease of operation and configuration, using drag-and-drop layouts, virtual PTZ, motion detection and video analytics support plus a wide range of smart, keyword, calendar and time-slice search options. Wave offers deep integration with the company’s NVRs and cameras, including specific support for H.265 streaming, Wisestream dynamic encoding, IVA, sound classification, simple focus setting, hallway views and camera profile and image configuration management. Valerus is the latest incarnation of the Vicon VMS platform. It has been designed to deliver ease of installation, simplicity of use and an open platform philosophy. The VMS uses standard web browsers as its user interface, ensuring familiarity along with ease of use when connecting to the system from remote locations and handheld or portable devices. Valerus is available in three versions: Try, Core and Pro. Try is a free version which supports up to 6 devices with a limited recording retention period of 7 days. Core supports up to 35 devices and 10 concurrent users while Pro is the unlimited version of the VMS with a range of advanced features. Valerus includes three search options to help users find recorded video evidence as quickly as possible. These are thumbnail search, museum search and events framework search, providing distinct methods dependent upon the nature of the query. Thumbnail search can be used to quickly review events over a long period of time. Museum search is designed to identify specific events in a defined area of interest. Finally, events framework search is used to easily interrogate data and correlated video from integrated third party software. Another feature is an enhanced health dashboard. This delivers statistics and detailed graphs for every camera and NVR on the network, making it easier to assess system behaviour and diagnose problems. The VMS features built-in dewarping and viewing controls for hemispheric 360 degree cameras, enabling users to get the most out of high-resolution fisheye cameras. Multiple view perspectives provide coverage, and presets and PTZ capabilities increase the flexibility on offer.